Do you remember your first brush with philosophical fiction? I was raised from a young pup on the stuff—Anthem (1938), Animal Farm (1945), Walden II (1948)—but it wasn’t until Ursula K. Le Guin’s “The Silence of the Asonu” (1998), a report on a species that speaks less as it ages, and the struggle of outsiders to impose meaning on its silence, that I truly understood why science fiction and fantasy are such reliable stages for our most critical conversations about human nature and its potential consequences. Philosophy has always been a key component of science fiction writing, whether we take the genre’s outset to lie with ancient depictions of voyages through the cosmos designed to make sense of competing terrestrial philosophies (e.g. Lucian’s Icaro-Menippus, sometime before A.D. 180); or Mary Shelley’s indictment of humanity’s ability to act with sound ethical judgment amid its increasing scientific intercessions into matters of life and death (Frankenstein, 1823); or Hugo Gernsback’s more commodified approach to the form in the 1920s, as a means of educating readers on new and imminent technologies, along with their cultural consequences. Nonetheless, we exist in a cultural moment that likes to affect squeamishness about expository storytelling, and champions the idea that, if it is to be compelling, “good” storytelling must be action-oriented or filled with exquisite sentences, with anything else in the mix veering too close to didacticism. Our long literary history offers plenty of counterpoint to the commercial, “aim-to-write-a-book-that-promises-movie-options” approach to science fiction and fantasy; but, more vitally, we have writers like Becky Chambers (and Neal Stephenson, and Kim Stanley Robinson) who continue to write in this more meditative mode, and in so doing remind us just what philosophical science-fiction can and must do for the world today. When I reviewed Becky Chambers’ A Closed and Common Orbit (2016), I noted the deftness with which her first novel’s reliance on telling was carried into the cleverness of worldbuilding in its sequel. 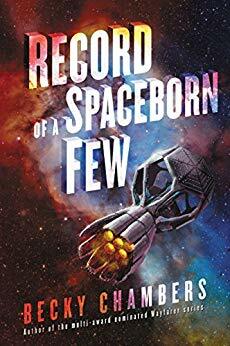 With her third work in the Wayfarer series, Record of a Spaceborn Few (2018), I will go one further: Chambers’s series illustrates not only the necessity of this approach to narrative, but also that telling can and should be regarded as a dynamic literary practice, with an expansive toolkit of approaches to building memorable and compelling science fiction tales. In her first novel, The Long Way to a Small, Angry Planet (2014), Chambers used speculative anthropology to explore the concept of family through a motley crew of aliens who not only have different needs, but also different expectations, of their surroundings—and different legacies, too, weighing upon their sense of communal responsibility. Here, the classic “new recruit” angle provides the main channel for exposition, as the character of Rosemary learns more about her crewmates and their interactions; but the book also uses passages presented as digital journal entries to allow other, seasoned crewmates to speak for themselves about people dearest to them. This tactic is critical in developing a multiplicity of perspectives—something that will prove a hallmark of Chambers’ writing throughout the Wayfarer series. In Chambers’s second novel, we were given to reflect on the nature of self through the lens of one particular being (a ship’s AI recently given an independent, standalone body), who has a clearer opportunity than most to decide fully what will and will not be a part of their personal definition. Here the newness of the shift in identity provides much of the book’s excuses for exposition, but the book is also bolstered by the survival tale of a small child who has to come into their sense of self after living their own version of a life with no significant personal autonomy. The conversations between child and AI provider likewise create opportunities for more expository education, while furthering the book’s central meditations on autonomy. The third Wayfarer novel rounds out this journey by reflecting more broadly on culture: what constitutes a culture? To whom? With what geography and lineage? What level of day-to-day variation? What tension points? What capacities for change? Here the story follows an even greater range of perspectives, which at first seem disparate but gradually dovetail around an event that clarifies and transforms different points of view. Even the book’s interspersed digital reports—a familiar expository device to most science-fiction readers—here have a deeper complexity, because the nature of the person writing those reports, and the role in general of outsiders writing about any culture, comes notably to the fore as the tale progresses. And so, yes, on the surface Record is a collection of perspectives about the Exodan Fleet, a homesteader culture of human beings who either hail from or continue to live on the generation ships that first brought humanity from a dying Earth into a wondrous, complicated network of alien life. It is the story of Tessa, mother of a rambunctious child, and their shared struggle with changing notions of safety aboard the Asteria. It is also the story of Eyas, a caretaker whose position—doing the critical work of recycling human remains—leaves her with questions about the limits of her purpose. Record is the story of sixteen-year-old Kip, restless to escape what he perceives as the monotony of life on the Fleet, and the story of twenty-three-year-old Sawyer, a descendant of the Fleet without family or future on his planet, who returns to try his luck at reintegration into his ancestral home. It’s also the story of Isabel, the Archivist who has lived long enough to see the Exodan Fleet—and all of humanity—shift from non-valued outsiders to full members of a galactic collective now transforming (or perhaps eroding) Fleet language and culture. And it’s the story of Ghuh’loloan, the “dog-sized, speckled-yellow, wet-skinned person” eager to learn about and report upon this human culture—while also acutely aware of the dangers that any cultural study will invariably yield. But simplicity can be deceiving. What might seem at first like obvious character arcs—two humans, for instance, seemingly poised to swap out positions within and beyond the Fleet, and a family coming to terms with new risks aboard their ancestral home—are disrupted with all the variability of real life. Circumstances change. People change. (As the saying goes, if you want to make the universe laugh, tell it your plans.) And so, while each of these characters is observing and responding to shifts in what it means to be a part of the Fleet, they are also confronting their own hard boundaries and unexpected potentials. And the benefit of this perceptiveness finds its greatest reward in Chambers’s philosophical work with the Wayfarer series. The truly splendid feat of Chambers’s storytelling is her ability to negotiate social concepts with immediate relevance to her readers—like universal basic income, and the role of globalism in the destabilization of local economies, and the impact of international languages on the preservation of minority cultures—through future-oriented discourse that avoids contemporary terminology entirely. The value of such a narrative feat cannot be understated: Chambers’s series gives us the ability, in a way perhaps rivalled only by the utopic likes of Star Trek, to imagine more equitable societies—and their persisting tension points—at a remove from our immediate, knee-jerk responses to political debate. If anything struck me as hyperbolic in this text, it was perhaps the story’s fixation on death as a social taboo—from a small child worried about eventually becoming dirt, to a caretaker struggling to make meaningful connections while serving as a communal symbol of rebirth, to an alien meditating on why a culture that cares so long for its offspring would reasonably personalize general reports of mortality more than other species. Central to Record are two major fatalities—one involving the loss of a whole ship, the other the loss of a single life—and each character, in its way, has to come to grips with notions of risk and legacy surrounding these two different (and yet not so different) incidents. Death literally feeds, in this novel, into the maintenance of the Exodan culture, and so too does preoccupation with what it means. In short, culture is an intrinsically fluid concept—both in Record of a Spaceborn Few, and in the real-life species that informs the anthropology of the Wayfarer series as a whole—and Chambers’s navigation of this theme provides extensive opportunity to reflect on similarly fluctuating cultural boundaries here on Earth. Granted, I’m not certain another book in this series could significantly advance the philosophical discourse these three have achieved. However, in this third volume, Chambers has plainly solidified herself as a speculative philosopher meriting not only the attention of traditional SF fans, but also anyone hoping for greater clarity about how to build better human societies here and now—before our ruination of the planet compels us, too, to take our chances amid more distant stars.